If I asked you to picture delicious European desserts in your mind, most of you would probably start imagining some sort of mouthwatering French concoction: macaroons, crepes, Creme Brulee, etc. However, there is a country in Europe that often gets overlooked when it comes to dessert, but is right up there in terms of decadence and deliciousness: Austria. This is the country that gave us the the Sacher Torte, the Linzer Torte, strudel, and a whole host of other delicious pastries. 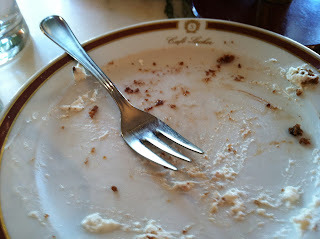 While I was in Austria, I devoured two very popular desserts: the Sacher Torte and Salzburger Nockerl. Now I'm sure most of you have heard of Sacher Torte. It's the chocolate cake made famous by the Hotel Sacher in Vienna and whose recipe is a closely guarded secret. Many people have tried to imitate the Sacher Torte, but if you want the real thing, you must go to the Hotel Sacher in Vienna or Salzburg. Well it just so happens that I was in Salzburg on my most recent trip to Europe and as you can see, an authentic slice of Sacher Torte was a necessary diversion in our sight-seeing schedule. Now, as a rule, Austrian desserts are not as sweet as American desserts so when you look at the decadence of the Sacher Torte, just know that your taste buds are not going to be overwhelmed by sweetness. A Sacher Torte is a bittersweet chocolate cake with a thin layer of apricot jam in the middle. It is traditionally served with a generous dollop of unsweetened whipped cream on the side, some say to counter-balance the somewhat dry nature of the cake. Now I am not a huge fan of chocolate, but even I will go out of my way to sit down and have a piece of this cake when I am in Vienna or Salzburg. Just make sure if you're ever in one of these two places that you have the ORIGINAL Sacher Torte and not an imitation. 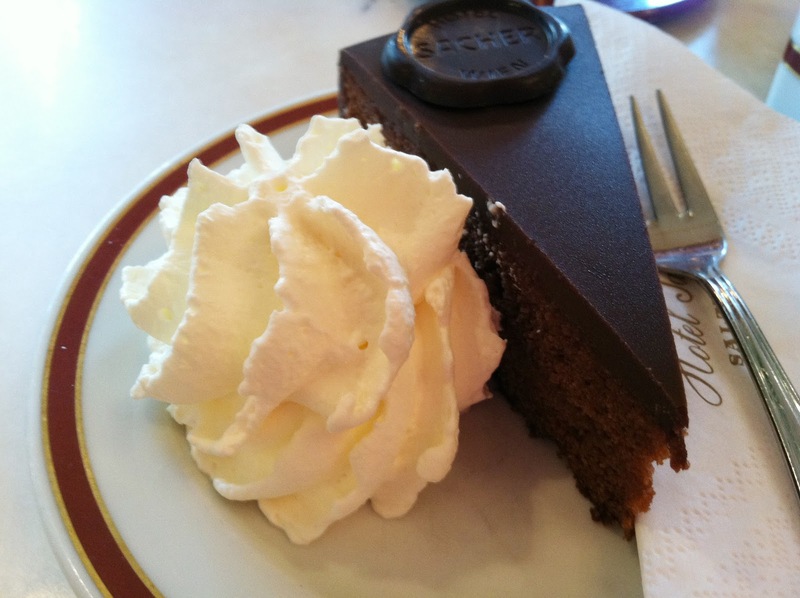 The second dessert I inhaled while in Austria is not as well known as Sacher Torte, and is much more simple, but it is equally delicious: Salzburger Nockerl. What is Salzburger Nockerl you ask? Well basically, it is a giant meringue that is cooked in the oven with a layer of fresh raspberries or fruit preserves like lingonberry jam. 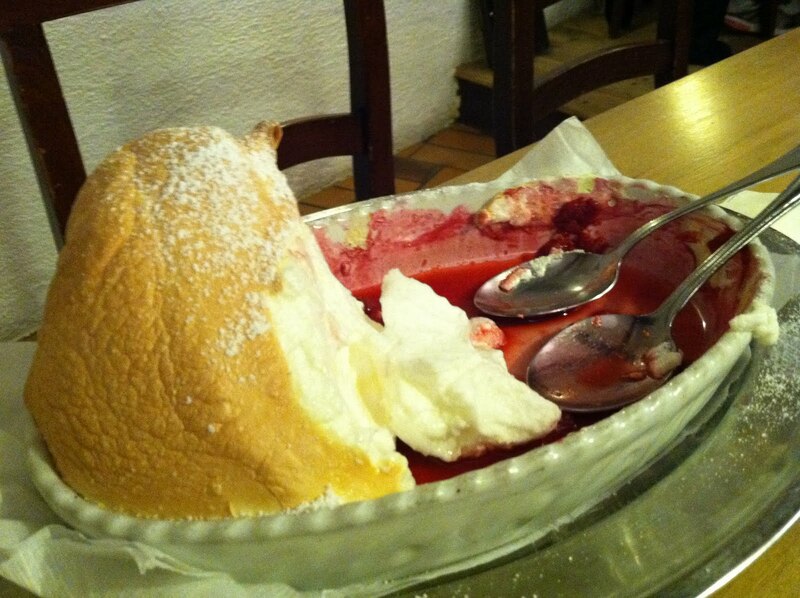 The Salzburger Nockerl my husband and I had at the Goldene Ente restaurant had fresh raspberries on the bottom. At first, Americans might balk at such a dessert because the sugar content is very minimal. In fact, as someone who often prefers salty foods to sweet, I kind of thought that the Nockerl needed a bit more sugar. But as I think back on it, I think that more sugar would have perhaps masked some of the other exciting sensations happening inside my mouth while eating this dessert. The outside was crispy and golden brown and the inside was like eating a cloud. Then you have the tartness of the berries to add another layered dimension to the dish. Even though I kind of balked at the dessert while I was eating it, proclaiming the need for more sweetness, now that I look back on it, I can still feel the divine experience of letting that light, fluffy meringue melt in my mouth and now I want to go in my kitchen and start whisking some egg whites. I don't think I've ever had a Salzburger Nockerl, but I love meringue, love fruit-based desserts, and am not big on the overly sweet. Sounds like something I would love. I'm with Beth F...I love fruit desserts, I much prefer them to chocolate so this looks like heaven to me. I don't think I'm skilled enough to pull off that meringue, though, so I'll have to wait till I get to Europe I guess...or a really good European cafe in America maybe? TheBookGirl meringue isn't really that hard to make. The hardest part of the process is actually separating the eggs. And if you have a stand-mixer, meringue is super simple because the mixer does all the work for you. 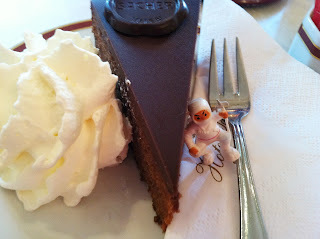 I've only had an occasional Sacher Torte- in Australia sadly never in Vienna. I like chocolate cake, but it's not my favourite. Still, one day I hope to find myself in Vienna or Salzburg some day, and I will definitely have one there, as it is a must do. I've never heard of Salzburger Nockerl before but it sounds just my thing. I love fruit dessert more than chocolate ones anyway. I too am a fan of meringues..and yes, fear not the meringues! they are really simple and quick. That Salzburger Knockerl sounds delicious - I love meringue. I'll have to give that a try! I'd never heard of it before. Yum! I would choose the Sacher Torte. I love chocolate and it looks so good!! My hubby would choose the Salzburger Nockerl. Both desserts look and sound yummy to me. I also like desserts that aren't overly sweet. I'm checking out the recipes. That cake with the meringue is now on my 'to bake' list. Thanks. I absolutely love Sachertorte, it is so delicious and the apricot jam in it is the best idea ever. Actually I wouldn't call Salzburger Nockerln simple, at least not as far as the cooking goes, because often they just collapse and your end result is not very pleasing to the eye. One of my fav Austrian desserts is Kaiserschmarrn, with tons of raisins and "Apfelmus". Both of these unique desserts sound delicious! I'm not sure I could ever make them but perhaps I'll make it to Austria to sample! All good! I have a cousin in Salzberg -- I'll have to ask her about that Nockerln thing. Such an interesting post. I loved learning about these desserts. With the intent to start dieting tomorrow, I should not be looking at (and drooling over) pictures of scrumptious desserts. 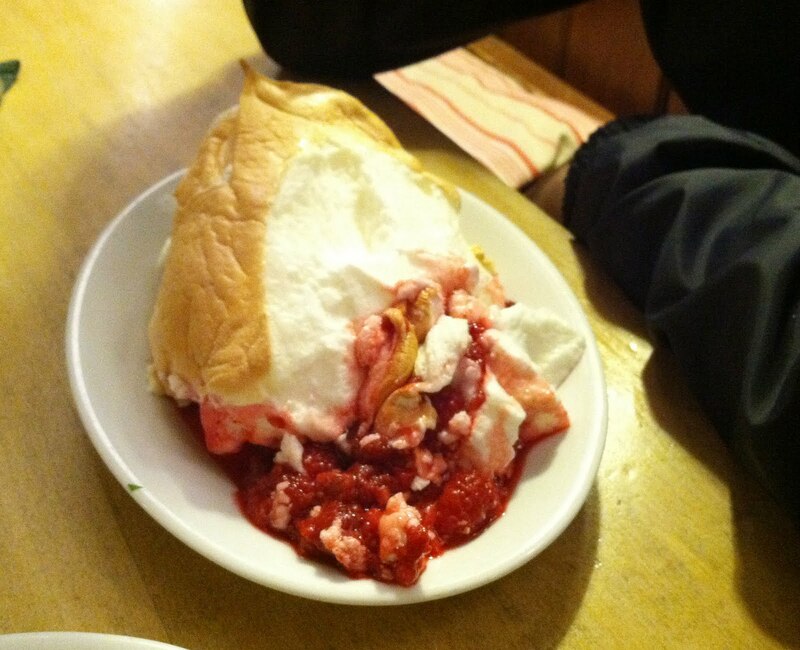 I've definitely never heard of The Salzburger Nockerl, but I sure as hell want one right about now. I love this post. I never have been to Austria but tries an Austrian pastry shop in DC. It was a wonderful revealation!